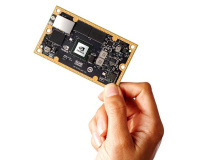 Nvidia has announced plans to get into the hobbyist development market with the launch of a new single-board computer based around its Tegra K1 system-on-chip (SoC) processor: the Jetson K1. 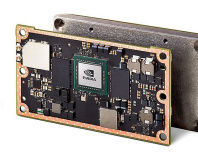 Based on a compact board layout measuring just 127mm x 127mm and 26mm in height, the Jetson K1 packs at its heart a Tegra K1 SoC boasting 192 Kepler-class graphics processing cores and the company's traditional quad-core ARM Cortex-A15 CPU cores with a fifth low-power companion core for background tasks. 2GB of memory is included on the board, along with a 16GB eMMC flash module for local storage - expandable through an SD slot or the on-board SATA port. The board also boasts a singular half-mini-PCIe slot, a single USB 2.0 port and a further USB 3.0 port, on-board Realtek-powered gigabit Ethernet connectivity, analogue audio input and output, an RS232 serial port, a full-size HDMI port and a 4MB boot flash module. An expansion port also offers a number of general-purpose input-output (GPIO) connections, along with serial UART, I2C, HSIC, SPI, CSI and DisplayPort or LVDS digital video outputs. Zotac has confirmed that it will be bringing the Jetson K1 to the UK, but has yet to announce availability and pricing. Nvidia's US arm, meanwhile, is taking pre-orders for the device in North America for $192 (around £116 excluding taxes) - making it a significantly pricier alternative to the popular, although considerably less powerful, Raspberry Pi. Serious price bump over the TK1.